Lev tahor is Hebrew for a ‘pure heart’. These words were spoken to me recently and I’ve been meditating upon them and what they mean as the essence of worship. As always, God is faithful to answer my prayers. I was immensely blessed when the Rabbi who spoke them to me elaborated on these very words when I visited his congregation. “Who may go up to the mountain of Adonai? Who can stand in his holy place? Those with clean hands and pure hearts …” (Psalm 24:3-4). Purity of heart is not something to be attained or acquired, it is the removal of all that is impure or tumah טמא in the heart. In order to have pure gold, it must go through the smelting process of heat to remove the impurities (or alloys). When it is pure, it is clear and maleable. It is the same with the lev tahor. Through the years of our lives as we grow older, we experience more pain and suffering. Deep hurts and insults, rejection and the death of numerous loved ones can harden our hearts with impurities like anger, bitterness, slander and spitefulness. Just like gold, we must go through a process of refining so that our lev is tahor and maleable. 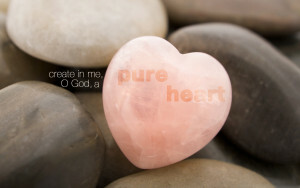 King David cried out to Adonai after he sinned with Bathsheeba, “Create in me a lev tahor, O Elohim … (Psalm 51:10 OJB). The word ‘create’ in this verse is bara, the same word used in Genesis 1:1 for when God ‘created’ the heavens and the earth. It is only through crying out to God with a repentant heart as David did that allows us to be purified by God’s refining fire and returns us to the lev tahor, the pure heart, that was first created within mankind in the Garden before all ‘sin broke loose’. “And as he gazed at the Sanhedrin, Rav Sha’ul [Paul] said, “Brothers, I have lived before God until this day with a lev tahor” (Acts 23:1). The lev is considered the seat of desire and passion that gives strength to thoughts and ideas while the soul or nephesh נפש is that part of the divine presence living in each of us. It is through the ‘ears of the soul’ that we hear God’s voice when He speaks to us. It is with the ‘heart’ that we respond to the ‘voice in the soul.’ However, when we have impurities that harden our heart we may not hear God’s voice as we think we do. We may be deceived by the impurities in our heart. This is why God said in Amos 5:21 and Isaiah 1:14 that He hated the very festivals and celebrations He gave to Israel. Their hearts were far from Him; they weren’t listening to His voice in their souls and their celebrations were a burden to him. Yeshua spoke the same words to us about lips that honor him, but having hearts that are far away from him. ‘These people honor me with their lips, but their hearts are far away from me” (Matthew 15:8). When we are young, we think that physical strength will bring us a more purified heart. However, that is not the case because as a man may become physically strong, his heart may lay far from God. Though there is glory in the physical strength of man’s youth there is a changing greater glory when man becomes old and his soul has been purified. His heart will follow in a passion for God and what comes out of him in his physical life will reveal what is in his pure heart. “So, flee the passions of youth; and, along with those who call on the Lord from a pure heart [lev tahor], pursue righteousness, faithfulness, love and peace” (2 Timothy 2:22). As we grow older, we should become more fully creatures of worship and praise through the study of the Scriptures, not to have more knowledge of God, but to see Yeshua in every word. It is in these moments when our soul has been purified and we have a lev tahor that will see God (Mattheew 5:8). “Having purified your nefashot (souls) by mishma’at (obedience) to the Truth, resulting in ahavah shel achvah (brotherly love) without tzevi’ut (hypocrisy), have fervent ahavah (agape) for one another, from a lev tahor (pure heart)” (1 Peter 1:22 OJB). ©2016 Tent Stake Ministries and the wisdom of Burt Yellin, Roeh Israel (I know I didn’t capture in its fullness).